Shari Leidich was curled on the floor in her children's room, crying. At 37, she was a mother of three and nearly incapacitated by the nerve ending discomfort and numbness of multiple sclerosis (MS), an auto-immune disease that attacks the nervous system. The intravenous steroid treatment she had started wasn't helping. Little did she know that the raw food diet she started in desperation seven years ago would lead to her founding Two Moms In the Raw, a family business whose organic granola and other snacks are today found on the shelves of grocers and coffee shops around the country. Leidich was first persuaded by an herbalist to try a raw-food diet when she was a few months into her steroid treatment. While the pain in her muscles and joints began to subside after the change in diet, eight months of eating raw vegetables left her craving more variety. Most raw-food products on the market were chalky or grainy, lacking flavor, she says. So she began making her own granola and crackers. The idea was born at a family reunion, when her husband Greg pointed to a bowl of granola and said: "If you can make something [that tastes] like that, I'll join you on your raw diet." Leidich began experimenting with dehydrated nuts, seeds, millet (a vitamin B-rich grain), buckwheat, and dried fruit including apples and berries to create her own granola, which unlike traditional granola has no added oils and is minimally processed. It quickly became popular with friends and family and within six months she was selling her homemade concoctions at the Boulder, Colo., farmers market. Customers began asking local grocers for the crackers -- made of flax seed and kelp -- and granola. Soon after, Vitamin Cottage, a regional natural grocery chain based in Denver, began stocking the products, which later were sold in a dozen of its stores. Shari Leidich founded Two Moms in the Raw (her mother Marsha Koolik is the other "mom") and incorporated the business in 2006. When the company was just starting out, Leidich subleased space from other commercial kitchens and bought ingredients in small batches. At the time, Leidich's husband was working full-time for a telecommunications company, while helping his wife get the business going. "We did a lot of sweat equity," he says. "[We were] going into the kitchen from 5 o'clock to 2 o'clock in the morning making product." 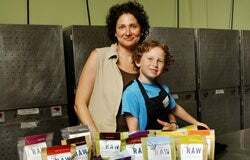 By the end of 2006, Two Moms in the Raw products were on the shelves of the Whole Foods Market on Pearl Street in Boulder. Getting the product into customers' mouths is what helped the brand gain footing at Whole Foods, says Tom Rich, grocery coordinator for the chain's Rocky Mountain Region. "You start with Two Moms In the Raw, and nobody has ever heard of it before. How are you even going to recognize that it's on the shelf?" says Rich, who was manager of the Pearl Street store when Leidich first began selling there. "She was out there day after day after day sharing the product with customers." Within two years, Greg Leidich quit his full-time telecom job to focus on Two Moms in the Raw. The Leidichs began leasing a 2,400 square-foot kitchen and office in Lafayette, Colo., where the company is based. Last year, they quadrupled the space to 10,000 square feet to match business demand. Much of the company's growth happened in the past year when Starbucks and Whole Foods Markets as well as other natural grocers, began offering Two Moms in the Raw products at their stores around the country. In 2010, annual revenue was at $1 million, a figure the company says it has already exceeded this year. Two Moms in the Raw now has 22 full-time employees, but as the company name suggests, family is at the core of its operation. Leidich's father and mother, Stanley and Marsha Koolik, run sales and store demos, and her father-in-law, Jim Leidich, oversees finance. "Everybody we have out there facing the public needs to embody and be connected in an authentic way to Shari and our mission," Greg Leidich says. The Leidichs also made an effort to ask local businesses what vendors they were using for ingredients and reached out to suppliers for recommendations on where else they could sell their product. "We are not rocket scientists or food people from way back," says Greg Leidich. "We are not ashamed to ask for referrals." The many certification requirements their products must meet in order to carry kosher, organic, non-genetically modified and gluten-free stamps on their packaging make maintaining high production standards essential, says Leidich. As a result, the Leidichs are careful about growing the business at a pace that production can keep up with. Maintaining a tight focus on a select group of products has been important to the company's success, says Greg Leidich. For five years, the core focus was granola and crackers. Only in the past year has the company begun selling other items like truffles, nut bars and bars made of chia, a seed high in protein and essential fatty acids. "Going slow and having a focus is a key to why we are still around," he says.